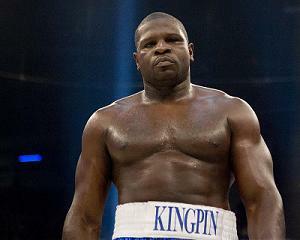 Heavyweight contender and former world title challenger, Kevin "Kingpin" Johnson, improved to (24-1-1, 10KO's) dominating 7'1", 300 lb. Julius "Towering Inferno" Long (15-15, 13KO's) over eight rounds on the undercard of Saturday night's Pay Per View "Redemption In America: The Journey Begins Now" card, headlined by Evander Holyfield (43-10-2, 28KO's) defending his WBF Heavyweight Title against Sherman Williams (34-11-2, 19KO's). at The Greenbrier's Colonial Hall in White Sulphur Springs, West Virginia. Johnson, who took the bout on just a few days notice, controlled the pace from the outset, taking the fight right to Long. Johnson dropped Long twice in the eighth to go on to win by scores of 79-71 on all three judges scorecards.